Featured Artist: Jim Reeves from the album 12 Songs Of Christmas . Song Key for this version: F# Major ... 6 sharps - F#, C#, G#, D#, A#, E#. If you are playing with the video: To make it easier so that everyone can play along, there are a couple of options available. Option 2: (Easiest option) Use a capo on the 4th fret and play in D Major... D, G, Em, A7 & E7. We will using this option for our session. If you are playing on your own (without the video) you can choose whichever key you like. Jim Reeves: Born James Travis Reeves on August 20th, 1923 in Galloway, Texas, U.S. He was a Country singer/songwriter who was also known as Gentleman Jim. First Recording: Bing Crosby & Carol Richards in 1950. First Performance: Bob Hope & Marilyn Maxwell in a motion picture called The Lemon Drop Kid. It was filmed between July and August in 1950, and released in March 1951. 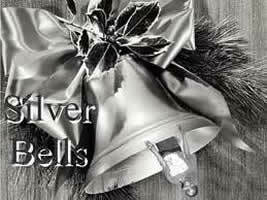 "Silver Bells" chords and lyrics are provided for educational purposes and personal use only.